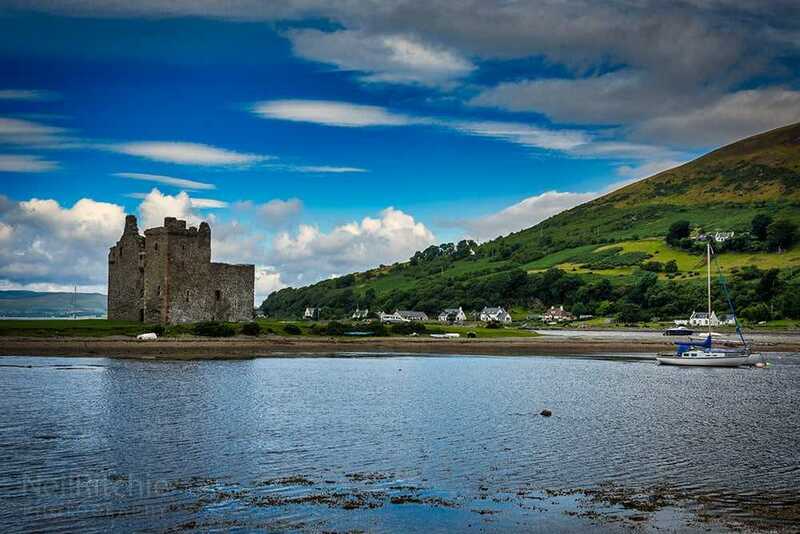 The ruins of Lochranza castle stand on the shores of Loch Ranza at the north end of the Isle of Arran and enjoys views out over the Kilbrannan Sound. The original structure that stood on the site was a hall-house built in the 1200s, possibly by Dougall MacSween, Lord of Knapdale. Dougall had a similar hall-house across the Kilbrannan sound at Skipness and the similarities of the two structures have led many to believe the one at Lochranza was his construction. It is also possible the original hall-house was constructed by Walter Stewart, Earl of Menteith, who was given the lands of the MacSweens by King Alexander III in 1262. During the power struggle with the Norwegians on the western seaboard, Alexander placed loyal supporters in the West, and the lands of the MacSweens (who were aligned with the Norwegian King) were given to the Stewarts. In 1263 the Norweigan King, Haakon IV, led a large Norse fleet into the Clyde. In a series of skirmishes, the Norse were defeated by a Scottish force led by Walter Stewart’s brother, Alexander of Dundonald, in what became known as the Battle of Largs. Robert the Bruce is said to have visited here in 1306, possibly the spot where he landed by boat, seeking shelter on the island. 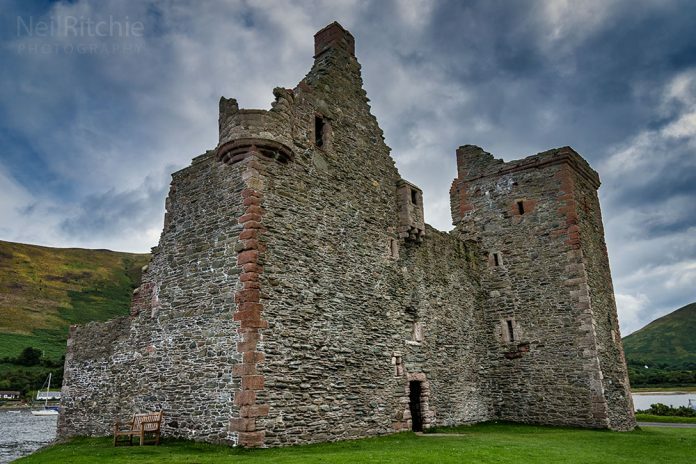 In 1371 Lochranza Castle was in the possession of his grandson, Robert II, who used it as a royal hunting lodge. In 1452 the castle and surrounding lands were granted to the Montgomeries of Eglinton by King James II and in the 1490s King James IV used the castle as a base during his campaign against the Macdonald Lord of the Isles. In 1614 the castle was again used as a base for military action against the Macdonalds. In the latter part of the 16th century, the Montgomeries modernized the castle from the hall-house into the L-plan tower house that you can see today. Oliver Cromwell’s troops held the castle in the 1650s following the Battle of Dunbar and by 1705 it was in the possession of the Hamilton family before it fell into disuse in the late 18th century.